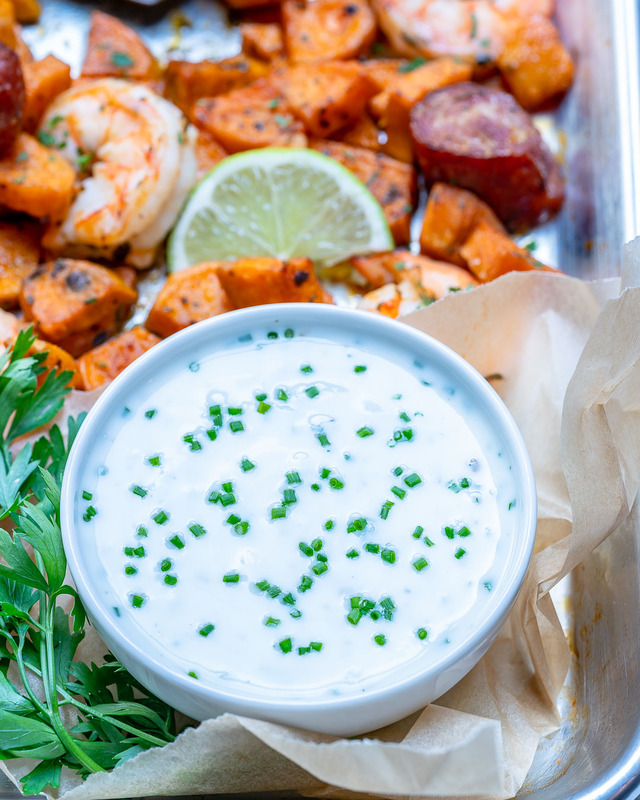 Super Easy Sheet Pan Shrimp ‘Boil’ + Homemade Ranch Sauce for Clean Eats! 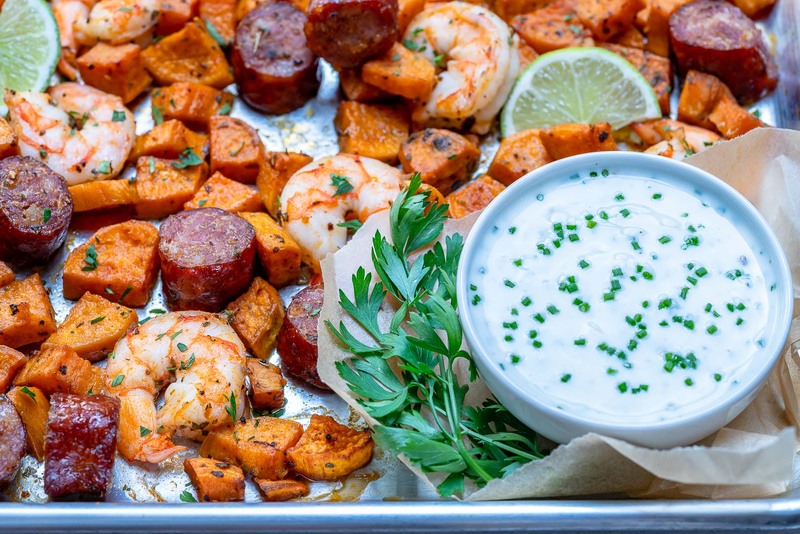 Summertime is definitely winding down, but we can make this SUPER EASY Sheet Pan Shrimp” Boil” year round! 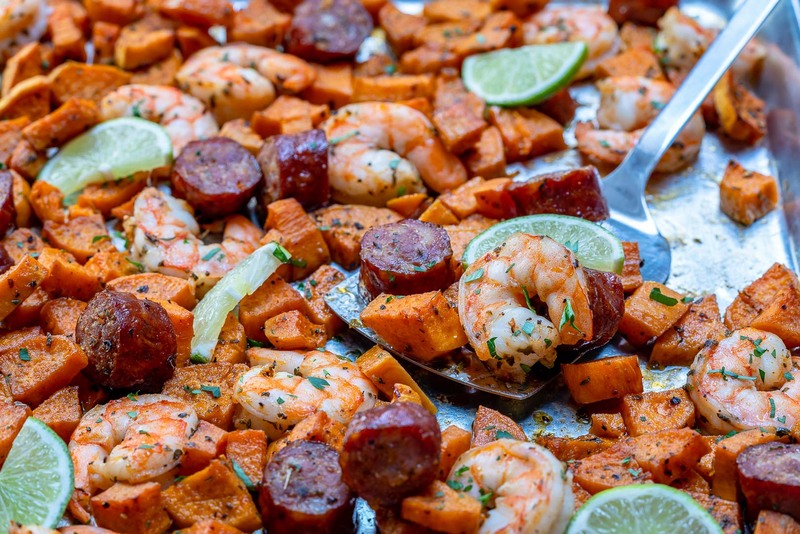 In a large bowl, combine sweet potatoes, sausage, garlic powder, oregano, cayenne pepper, smoked paprika, and oil. Season with sea salt and pepper to your taste. 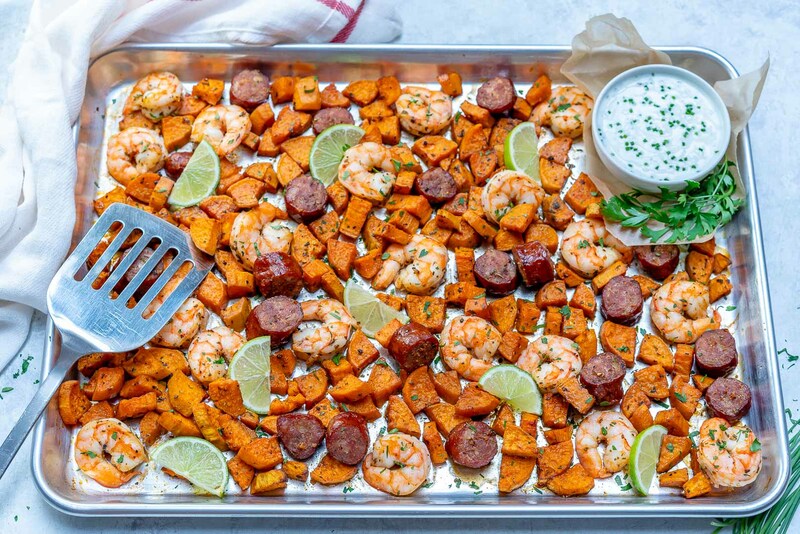 Toss gently to combine then place everything (except for the shrimp) onto one large rimmed baking sheet in a single layer. Bake until the sweet potato pieces are tender, about 12 minutes. Remove the pan from the oven and stir in the shrimp. 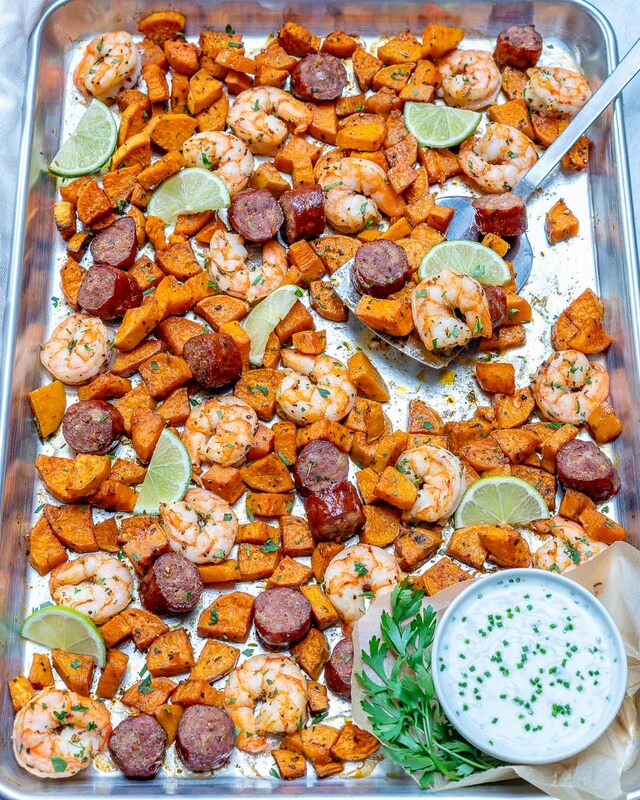 Return pan to the hot oven, and bake for an additional 3-4 minutes, or just until the shrimp is cooked through and no longer translucent. 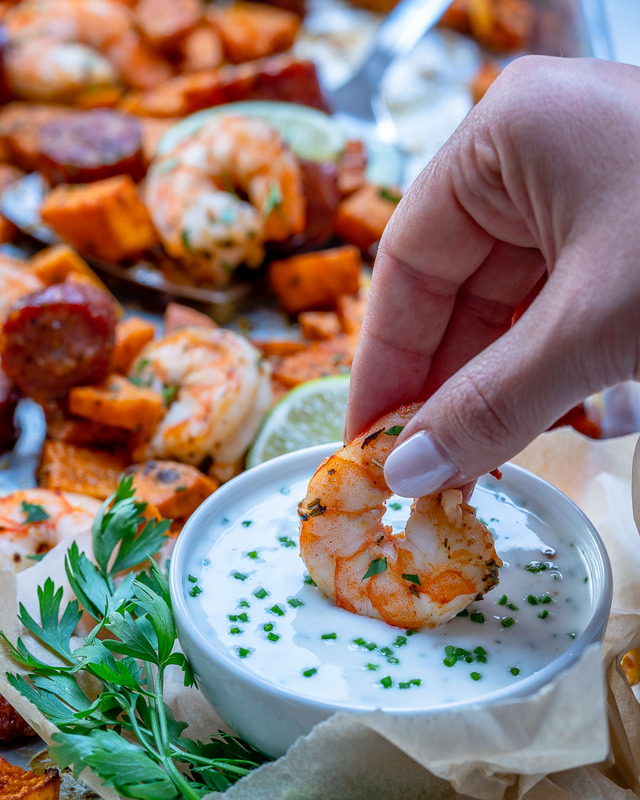 Meanwhile, make the dip by adding all the ranch sauce ingredients to a medium glass bowl. Whisk until well combined. Once everything is cooked through, remove the pan from the oven and sprinkle with fresh parsley and garnish with lemon wedges. Serve together with the homemade Ranch sauce and enjoy! 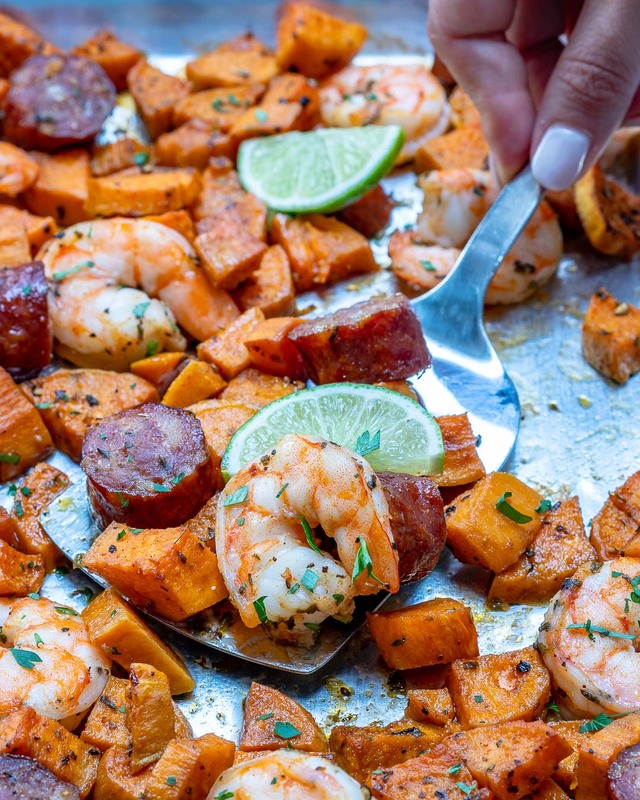 In a large bowl, combine sweet potatoes, sausage, garlic powder, oregano, cayenne pepper, smoked paprika, and oil. 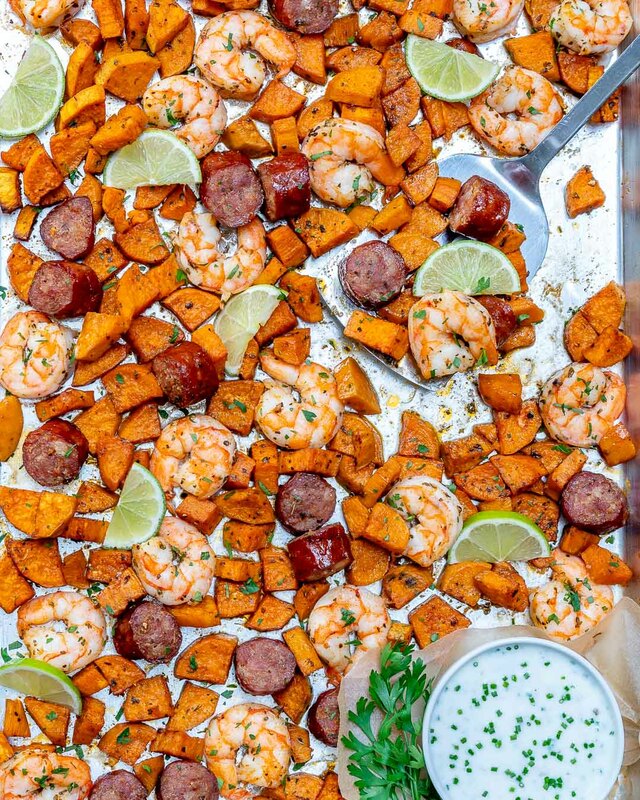 Toss gently to combine then place everything (except for the shrimp) onto one large rimmed baking sheet in a single layer. Bake until the sweet potato pieces are tender, about 12 minutes. 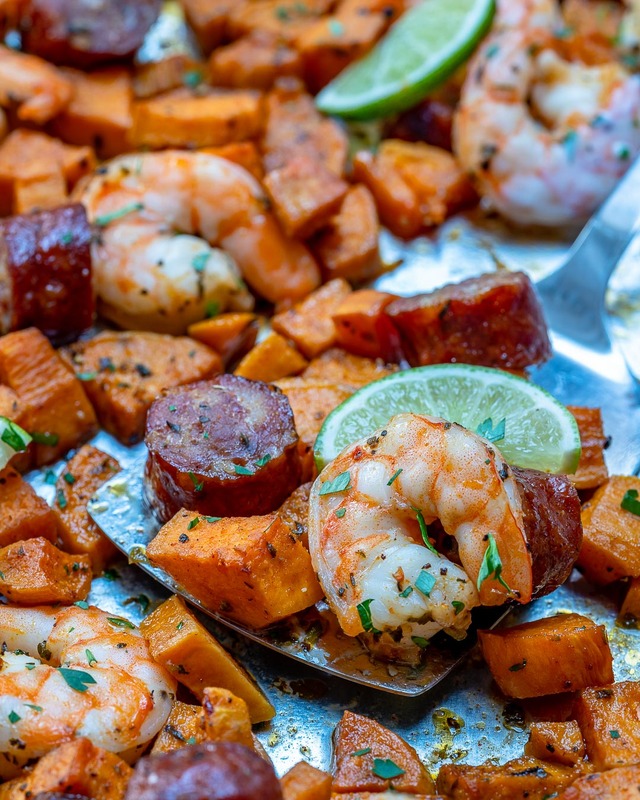 Return pan to the hot oven, and bake for an additional 3-4 minutes, or just until the shrimp is cooked through and no longer translucent. Meanwhile, make the dip by adding all the ranch sauce ingredients to a medium glass bowl. Once everything is cooked through, remove the pan from the oven and sprinkle with fresh parsley and garnish with lemon wedges. Serve together with the homemade Ranch sauce and enjoy!